"Wait till you see what happens next…!" Netflix has unveiled a teaser trailer for an upcoming holiday film titled The Christmas Chronicles, starring Kurt Russell (indeed, that awesome actor) as Santa Clause. The film tells the story of a sister and brother, Kate and Teddy Pierce, whose Christmas Eve plan to catch Santa Claus on camera turns into an unexpected journey that most kids could only dream about. 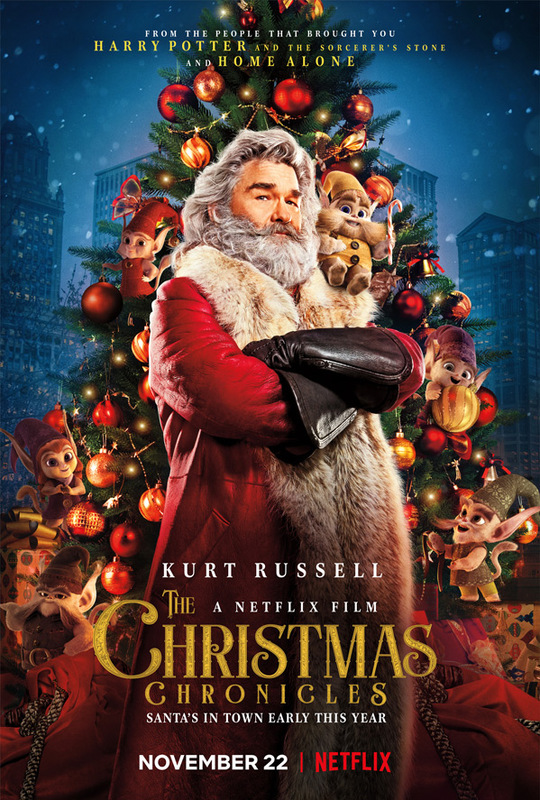 "No one is better suited than Kurt Russell to bring our version of a rugged, charismatic, and hilarious Santa Claus to life," director Clay Kaytis explains. The full cast includes Kimberly Williams-Paisley, Oliver Hudson, Judah Lewis, Lamorne Morris, Martin Roach, Darby Camp, and Lauren Collins. This teaser does actually have plenty of footage and this looks, uh, crazy. And weird. And magical. And funny. And hip. And weird, again. I don't know - you have to see this for yourself. Maybe a brand new holiday classic on the way? The Christmas Chronicles, a holiday adventure from producer Chris Columbus and director Clay Kaytis, tells the story of sister and brother, Kate (Darby Camp) and Teddy Pierce (Judah Lewis), whose Christmas Eve plan to catch Santa Claus (Kurt Russell) on camera turns into an unexpected journey that most kids could only dream about. After staking out Santa’s arrival, they sneak into his sleigh, cause it to crash and nearly derail Christmas. As their wild night unfolds, Kate and Teddy work together with Santa - as you've never seen him before - and his loyal Elves to save Christmas before it's too late. The Christmas Chronicles is directed by American filmmaker Clay Kaytis, a former animator and director of The Angry Birds Movie making his live-action directorial debut. The screenplay is written by Matt Lieberman. Netflix will release Kaytis' The Christmas Chronicles streaming exclusively starting November 22nd this fall. Your thoughts?